The White Rhino has a massive body and large head, a short neck and broad chest. This rhino can exceed 6000 pounds, have a head-and-body length of 11-14 feet and a shoulder height of 60-73 inches. White rhinos eat mainly grasses and spend about half of the day eating, one third resting, and the rest of the day doing various other things. White Rhinos, like all species of rhino, love wallowing in mudholes to cool down. On its snout it has two horns made of keratin. The front horn is larger that the back horn and averages 24 inches in length and can reach 59 inches. 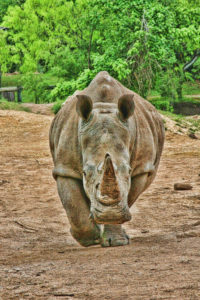 The White Rhinoceros also has a noticeable hump on the back of its neck, this is muscle which supports its large head. Each of the rhino’s four stumpy feet has three toes. White Rhinos can live up to 40-50 years old. White rhinos can run up to 30 miles per hour. The name of the White Rhinoceros has nothing to do with the color. The English word “white” is said to have been derived by mistranslation of the Dutch word “wijd”, which means “wide” in English. The word “wide” refers to the width of the Rhinoceros mouth.